Disc golf (also called Frisbee golf or sometimes frolf) is a flying disc sport in which players throw a disc at a target; it is played using rules similar to golf. It is often played on a course of 9 or 18 holes. Players complete a hole by throwing a disc from a tee area toward a target, throwing again from the landing position of the disc until the target is reached. Usually, the number of throws a player uses to reach each target are tallied (often in relation to par), and players seek to complete each hole, and the course, in the lowest number of total throws. Flying disc, consider bringing cash for some pay to play courses. The game is played in about 40 countries and currently there are over 103,000 active members of the PDGA worldwide. Disc golf was first invented in the early 1900s. The first game was held in Bladworth, Saskatchewan, Canada in 1926. Ronald Gibson and a group of his Bladworth Elementary School buddies played a game of throwing tin lids into 4 foot wide circles drawn into sandy patches on their school grounds. They called the game Tin Lid Golf and played on a fairly regular basis. However, after they grew older and went their separate ways, the game came to an end. It was not until the 1970s that modern disc golf would be introduced to Canadians at the Canadian Open Frisbee Championships in Toronto and Vancouver, BC. Modern disc golf started in the early 1960s, but there is debate over who came up with the idea first. The consensus is that multiple groups of people played independently throughout the 1960s. Students at Rice University in Houston, Texas, for example, held tournaments with trees as targets as early as 1964, and in the early 1960s, players in Pendleton King Park in Augusta, Georgia would toss Frisbees into 50-gallon barrel trash cans designated as targets. In 1968 Frisbee Golf was also played in Alameda Park in Santa Barbara, California by teenagers in the Anacapa and Sola street areas. Gazebos, water fountains, lamp posts, and trees were all part of the course. This took place for several years and an Alameda Park collectors edition disc still exists, though rare, as few were made. Clifford Towne from this group went on to hold a National Time Aloft record. Two early coordinators of the sport are George Sappenfield and Kevin Donnelly, who, through similar backgrounds and the help of Ed Headrick at Wham-O, were able to individually spread the sport in their California cities. Donnelly began playing a form of Frisbee golf in 1959 called Street Frisbee Golf. In 1961, while a recreation leader and then recreation supervisor for the City of Newport Beach, California, he formulated and then began organizing Frisbee golf tournaments at nine of the city's playgrounds he supervised. This culminated in 1965 with a fully documented, Wham-O sponsored, citywide Frisbee golf tournament spearheaded by "Steady" Ed Headrick at Wham-O. This highly publicized tournament included hula hoops as holes, with published rules, hole lengths, pars, and prizes; an event in which Walter Frederick Morrison, inventor of the Pluto Plato and Frisbee inventor "Steady"' Ed Headrick, was in attendance. In 1965, Sappenfield was a recreation counselor during a summer break from college during which, he set up an object course for his children to play on. When he finished college in 1968, Sappenfield became the Parks and Recreation supervisor for Conejo Recreation and Park District in Thousand Oaks, California. Sappenfield planned a disc golf tournament as part of a recreation project and contacted Wham-O Manufacturing to ask them for help with the event. Wham-O supplied Frisbees for throwing, and hula hoops for use as targets. 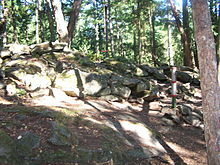 Before 1973 and the invention of the disc golf target called the disc pole hole, there were only a few disc golf object courses in the U.S. and Canada. Despite having never heard of the International Frisbee Association (IFA) that Ed Headrick and Wham-O had put together, or ever seeing a copy of the IFA Newsletter, Jim Palmeri, his brother, and a small group of people from Rochester, NY, had been playing disc golf as a competitive sport on a regular basis since August 1970, including tournaments and weekly league play. By 1973, they had even promoted two City of Rochester Disc Frisbee Championship events which featured disc golf as the main event. In Canada, beginning in 1970, Ken Westerfield and Jim Kenner played Frisbee golf daily on an 18 object hole course they designed at Queen's Park in downtown Toronto and presented Canada's first disc golf competitions. In California, the Berkeley Frisbee Group established a standardized 18 hole object course on the Berkeley campus in 1970. University of Michigan Nichols Arboretum, Ann Arbor had an object Frisbee golf course designed in the early 1970s. Wham-O's $50,000 Disc Golf Tournament was significant turning point for disc golf. Held in Huntington Beach, California. The tournament was groundbreaking, first and foremost because of the cash involved, its massive payout right in the title, but also because the competitors had to qualify for an invitation. 72 qualifying events were established around the country, bringing in the best disc golfers from across the United States. "Steady Ed" Headrick and Dave Dunipace are two inventors and players who greatly impacted how disc golf is played. In 1976 Headrick formalized the rules of the sport, founded the Disc Golf Association (DGA), the Professional Disc Golf Association (PDGA), the Recreational Disc Golf Association (RDGA) and invented the first formal disc golf target  with chains and a basket. Dave Dunipace invented the modern golf disc in 1983, with the revolutionary change of adding a beveled rim, giving the disc a greater distance and accuracy. Dave was one of the founders of Innova, a well-known disc manufacturer. In 1982 Ed Headrick turned over control of the PDGA to the players and Ted Smethers to be run independently and to officiate the standard rules of play for the sport. "Steady Ed" Headrick began thinking about the sport during his time at Wham-O Toys where he designed and patented the modern day Frisbee. Headrick designed and installed the first standardized target course in what was then known as Oak Grove Park in La Cañada Flintridge, California. (Today the park is known as Hahamongna Watershed Park). Ed worked for the San Gabriel, California-based Wham-O Corporation and is credited for pioneering the modern era of disc sports. Ed Founded "The International Frisbee Association (IFA)" and began establishing competitive standards for various sports using the Frisbee such as Distance, MTA, TRC, Accuracy, Freestyle, and Guts. Headrick coined and trademarked the term "Disc Golf" when formalizing the sport and patented the Disc Pole Hole, the first disc golf target to incorporate chains and a basket on a pole. He started designing the target because he was tired of arguing over what counted as a scoring disc with his friends. He founded the Professional Disc Golf Association (PDGA) and Recreational Disc Golf Association (RDGA) for competitive and family-oriented play, respectively, and worked on standardizing the rules and the equipment for the growing sport. Headrick abandoned his trademark on the term "Disc Golf", and turned over control and administration of the PDGA to the growing body of disc golf players in order to focus on his passion for building and inventing equipment for the sport. Disc golf courses usually have nine or 18 holes, and exceptions most often have holes in multiples of three. Holes are designed to require a range of different throws to challenge players with different strengths or particular skills. According to the DGA, an average course hole should range around 200–240 feet (61–73 m) per hole.. As per the PDGA Course guidelines, hole lengths can also be as long as a 1,000 feet. Course designers use trees, bushes, elevation changes, water hazards, and distance variation, along with out-of-bounds zones and mandatory flight paths, to make each hole challenging and unique. Many courses include multiple tee positions or multiple target positions to cater to players of different ability levels. Disc golf courses are usually built in more natural and less manicured environments than golf and require much less maintenance. Professional course designers consider safety a critical factor in course design, and are careful to minimize the danger of being hit by a flying disc while providing designs that create strategy in play and variety in shots for enjoyment. Many courses are central organizing points for local disc golf clubs, and some include shops selling disc golf equipment. More than 80% of the courses listed on dgcoursereview.com are listed as public and free to play. A disc golf tee position is usually a pad of concrete, asphalt, rubber, gravel, or artificial turf. The PDGA recommends that they be no smaller than 1.2 meters wide by 3 meters long. Many courses have only the front of the tee position marked with a board of timber in the ground. Some courses have no tees at all. Established courses have tee signs near each tee position, showing a simple map of the hole, distance to the hole, par, out-of-bounds areas, mandatory paths, and a unique name for the hole. They are often supplemented with a larger sign near the course entrance which has a course map and other information. A red disc sailing towards a "Tonal Pole" style target at the disc golf course on Pender Island. 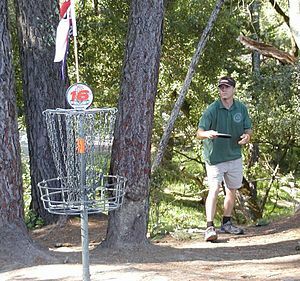 Although early courses were played using trees, fence posts, or park equipment as the target, modern courses typically use tone targets or standard disc golf baskets. Tone targets are designed to make a distinctive sound when hit with a disc. Baskets are now much more common, which are constructed with a central pole holding a basket under an assembly of hanging chains. A disc which hits the chains is often, but not always, deflected into the basket. Discs must land inside the basket or on the chains to count the hole as completed. There are many different brands of baskets made by numerous manufacturers. The sport of disc golf is set up similar to a game of golf. A "round" is played on a disc golf course consisting of a number of "holes", usually 9 or 18. Each hole includes a tee position for starting play and a disc golf target some distance away, often with obstacles such as trees, hills or bodies of water in between. Players begin by throwing a disc from the tee, without crossing over the front of the tee prior to releasing the disc when throwing. This could lead to a fault similar to the foot fault in bowling. Players then navigate the hole by picking up the disc where it lands and throwing again until they reach the target. The object of the game is to get through the course with the lowest number of total throws. Play is usually in groups of five or fewer, with each player taking turn at the tee box, then progressing with the player furthest from the hole throwing first, while the other players stand aside. Each course is unique, so each course requires a different combination of throws to complete, with the best players aiming to shape the flight of the disc to account for distance, terrain, obstacles and weather. In order to facilitate making different shots, players carry a variety of discs with different flight characteristics, choosing an appropriate disc for each throw. Some players also carry a mini marker disc, used to accurately mark the throwing position before each throw. Use of mini marker discs is particularly prevalent in formal competitive play. Many courses include out-of-bounds areas, commonly called "OB zones" or just "OB". If the disc lands in these areas, the player is usually required to add a penalty throw onto his or her score and continue play from near where the disc entered the out-of-bounds zone. Some courses include out-of-bounds areas with special rules requiring the player the resume play from a specified area called a drop zone, or requiring the player to restart the hole from the tee. Some courses also include Mandatories (also called "Mandos") which require the path of the disc to be above, below or to one side of a specific line indicated by a sign. By tradition, players throw from the tee box in the order of their score on the previous hole, with the lowest scorer throwing first. Most players also follow a loose code of courtesy while playing, which includes norms such as standing out of the sight line of the throwing player and avoiding making distracting noises. Because a thrown disc could injure someone, the Professional Disc Golf Association recommends that players "Never throw into a blind area or when spectators, pedestrians or facility users are within range." Formal competitive play is governed by the PDGA Official Rules of Disc Golf and the PDGA Competition Manual for Disc Golf events. The golf discs used today are much smaller and heavier than traditional flying discs, typically 8–9 inches (20–23 cm) in diameter and weighing between 120 and 180 grams. The PDGA prohibits discs heavier than 200 grams. Discs used for disc golf are designed and shaped for control, speed, and accuracy, while general-purpose flying discs, such as those used for playing guts or ultimate, have a more traditional shape, similar to a catch disc. There is a wide variety of discs used in disc golf and they are generally divided into three categories: putters, all-purpose mid-range discs, and drivers. Putters are similar to the discs used in simple games of catch, such as the Wham-o brand Frisbee. They are designed to fly straight, predictably, and very slowly compared to mid-range discs and drivers. They are typically used for tight, controlled shots that are close to the basket, although some players use them for short drives where trees or other obstacles come into play. Usually a pro carries 1–7 putters depending on their flight characteristics. As a beginner it is suggested that you only use a putter or mid-range. Mid-range discs have slightly sharper edges that enable them to cut through the air better. These discs are usually faster, more stable, and have a longer range than a putter. Some beginner players will use mid-ranges as drivers as it is recommended that new players stay away from higher speed drivers to help them advance quicker. They are good all-around discs and are suitable for a first time player or the most advanced pros. Stability is the measurement of a disc's tendency to bank laterally during its flight. A disc that is over-stable will tend to track left (for a right handed, backhand throw), whereas a disc that is under-stable will tend to track right (also for a right handed, backhand throw). The stability rating of the discs differs depending on the manufacturer of the disc. Innova Discs rate stability as "turn" and "fade". "Turn" references how the disc will fly at high speed during the beginning and middle of its flight, and is rated on a scale of +1 to −5, where +1 is the most overstable and −5 is the most understable. "Fade" references how the disc will fly at lower speeds towards the end of its flight, and is rated on a scale of 0 to 5, where 0 has the least fade, and 5 has the most fade. For example, a disc with a turn of −5 and fade of +1 will fly to the right for (right handed, backhand throw) the majority of its flight then curl back minimally left at the end. A disc with a turn of −1 and a fade of +3 will turn slightly right during the middle of its flight and turn hard left as it slows down. These ratings can be found on the discs themselves or from the manufacturer's web site. Discraft prints the stability rating on all discs and also provides this information on their web site. The stability ranges from 3 to −2 for Discraft discs; however Discraft's ratings are more of a combination of turn and fade with the predominance being fade. Spin (rotation) has little influence on lift and drag forces but impacts a disc's stability during flight. Imagine a spinning top. A gentle nudge will knock it off its axis of rotation for a second, but it will not topple over because spin adds gyroscopic stability. In the same way, a flying disc resists rolling (flipping over) because spin adds gyroscopic stability. A flying disc will maintain its spin rate even as it loses velocity. Toward the end of a disc's flight, when the spin and velocity lines cross, a flying disc will predictably begin to fade. The degree to which a disc will fade depends on its pitch angle and design. There are a variety of different discs, each with a specific plastic made with them. Plastics such as DX, J-Pro, Pro-D, X-Line, D-line, retro, and R-Pro from Innova discs, latitude 64, discmania, and Discraft are some of the less durable plastics, but good for beginners due to their lower prices, compared to the higher end plastics. Plastics such as Champion, Titanium, FLX, GStar, Gold Line, Tournament Plastic, Fuzion and Star plastics, which are the best offered from the same companies, offering the best quality, durability and flight compared to the other types available. There are also plastics that provide additional functionality, specifically glow in the dark plastic and plastic that allows the disc to float in water. Most companies also offer a line of plastic that is much lighter than the maximum throwing weight (normally filled with air bubbles) which is conducive to beginners or players with less arm speed. Players might prefer bright colored discs to contrast most green flora and recover their disc easier. While there are many different grips and styles to throwing the disc, there are two basic throwing techniques: backhand and forehand (or sidearm). These techniques vary in effectiveness under different circumstances. Their understanding and mastery can greatly improve a player's game, and offer diverse options in maneuvering the disc to the basket with greater efficacy. Many players use what is referred to as a run-up during their drive. This is practiced to build more forward disc momentum and distance. Throwing styles vary from player to player, and there is no standard throwing style. All discs when thrown will naturally fall to a certain direction determined by the rotation direction of the disc when released, this direction is termed Hyzer, the natural fall of the disc, or Anhyzer, making the disc fall against its natural flight pattern. For a right-handed backhand throw (RHBH), the disc will naturally fall to the left. For a right-handed forehand throw (RHFH), the disc will naturally fall to the right. For a left-handed, backhand throw (LHBH), the disc will naturally fall to the right. For a left-handed, forehand throw (LHFH), the disc will naturally fall to the left. To perform this throw, the disc is rapidly drawn from across the front of the body, and released towards a forward aimpoint. Due to the potential snap available with this technique, one can expect greater distance than with a forehand throw. It is important to initiate momentum from the feet and allow it to travel up the body, hips and shoulders, culminating in the transfer of energy to the disc. The forehand (sidearm) throw is performed by drawing the disc from behind and partially across the front of the body: similar to a sidearm throw in baseball. The term sidearm actually predates the term forehand, which is seemingly in use today as a simpler means to communicate the technique, equating to a tennis forehand. The following examples of throws may be used to better deliver a disc where the former common two throws would be impeded by obstacles such as bushes, trees, boulders, or artificial structures. The Hatchet (or Tomahawk). Gripped similarly to the sidearm toss but thrown with an overhand motion; the disc orientation nearly perpendicular to the ground over much of the flight. The Thumber (or U.D.). Thrown in an overhand manner but with thumb held on the disc's underside. The Roller. Thrown either backhand or forehand, the disc will predominately be in contact with the ground. The disc remains in motion while travelling on its edge at a slight angle, and can travel exceedingly far in ideal situations. Once perfected, the roller is an invaluably versatile tool in the golfer's arsenal. The Turbo-Putt Thrown with a putter when the player holds the disc upright, supported in the middle by the thumb, with the finger tips outside of the edge, somewhat like a waiter holding a platter. The player stands with the leg opposite from the throwing arm forward, reaches back, and then extends their arm towards the basket, throwing the disc in a motion similar to that of throwing a dart. Ideally the thrower does not rotate his wrist; the act of following through will give the disc its spin. The Turbo-Putt is a throw known for its accuracy, but it has extremely limited range. The Baseball or Grenade. Thrown as in the backhand, but with the disc upside-down. This shot is used often to get up and down on a short shot where there is danger of a shot rolling away or going out of bounds if thrown too far. Primarily used on downhill shots but can be used to go up and over. Also due to the quick turn and backspin of this shot, it is sometimes used to get out of the woods. The Overhand wristflip (or chicken-wing [ambiguous origin][dubious – discuss] ). This is a very difficult and stylized throw with which accomplished free-stylers and classic ultimate players are familiar; it is less used in disc golf. It is thrown in the same manner the "baseball" but drawn on the sidearm side of the body, and by inverting the arm and disc. Using the thumb as the power finger, the disc is drawn from the thigh area rearwards and up from behind the body to over the shoulder, releasing toward a forward aimpoint. The disc flies in a conventional flight pattern. To the untrained eye, this appears to be an ungainly throw. It is, however, elegant and accurate. The term "overhand wristflip" has been in use since at least circa 1970. Stroke Play is the most common scoring method used in the sport but there are many other forms. These include match play, skins, speed golf and captain's choice, which in disc golf is referred to as "doubles" (not to be confused with partner or team play). Regardless of which form of play the participants choose, the main objectives of disc golf are conceptually the same as traditional golf in the sense that players follow the same scorekeeping technique. Condor – Where a player is four throws under par, or "-4". Albatross (or double-eagle) – Where a player is three throws under par, or "-3". Eagle (or double-birdie) – Where a player is two throws under par, or "-2". Birdie – Where a player is one throw under par, or "-1". Par – Where a player has thrown par, or "0". Bogey – Where a player is one throw over par, or "+1". Double Bogey – Where a player is two throws over par, or "+2". Triple Bogey – Where a player is three throws over par, or "+3". Doubles play is a unique style of play that many local courses offer on a weekly basis. In this format, teams of two golfers are determined. Sometimes this is done by random draw, and other times it is a pro-am format. On the course, it is a "best-disc" scramble, meaning both players throw their tee shot; and then decide which lie they would like to play. Both players then play from the same lie, again choosing which lie is preferable. The World Amateur Doubles Format includes best shot, alternate shot, best score (players play singles and take the best result from the hole) and worst shot (both players must sink the putt). Tournaments are held nationwide and year long in the United States. Sanctioned Tournament play is communicated through the Professional Disc Golf Association Membership. The PDGA provides international, professional, and amateur disc golf tournaments as well as communicates event results, opinions and other information beneficial to the sport via electronic and printed media. In 1982 the PDGA hosted the first World Championship Tournament. Since then, the World Championships have been held in 17 different American states, as well as Toronto, Ontario. Disc golf tournaments are popular around the world. As with traditional golf, there are many championship tournaments. One of the largest is the United States Disc Golf Championship. Every year, the largest teams tournament in the world is held in Austin, Texas, by John Houck. Disc golf is a rapidly growing sport worldwide, and is the 4th fastest growing sport in United States, behind mixed martial arts, roller derby, and parkour. DGCourseReview.com, which tracks courses worldwide along with opening dates, shows a rapid increase in installed permanent courses with an average of more than 400 new courses added each year between 2007 and 2017. The site lists 6800 courses worldwide (in May 2017). Although most players play on a casual, amateur level, the professional disc golf scene is also growing rapidly, with the top professionals playing full-time and earning their livings through tournament winnings and sponsorship from equipment manufacturers. Online viewership of major tournaments and events has increased rapidly, with coverage of several tournaments in 2016 achieving more than 75,000 views on YouTube. and a clip focused on a single throw by professional Philo Braithwaite achieving more than 1.2 million views. While there are more male than female players, the Women's Disc Golf Association exists to encourage female players and arrange women's tournaments. A PDGA survey states that out of its 35,662 active members in 2016, 7.6% are female, or about 2,728. Several companies have started programs and websites to help attract women to the sport. The PDGA Women's Committee is "Dedicated to Attract, Encourage, and Retain Female Participation in Organized Disc Golf Events". The PDGA Women's Committee set historical records on 12 May 2012 by running the Inaugural Women's Global Event that attracted 636 female players in 24 states and 4 countries. The Women's Global Event was expected to take place every two years from 2014, with hopes of increasing the number of participants. There are also Disc golf companies such as Disc-Diva, that have started up with a primary, though not exclusive, focus on women in the sport, promoting accessories geared towards women and using catch phrases like "you wish you threw like a girl". Sassy Pants is another group that focuses on getting more involvement from women in the sport, advocating for sponsorship of women to enter tournaments. Women's disc golf teams are involved in the National Collegiate Disc Golf Championship, and the Mississippi State Women's Team were the inaugural champions. ^ "PDGA Player Search". PDGA. Retrieved 6 April 2016. ^ "What is Disc Golf - DGA | Disc Golf Association". DGA | Disc Golf Association. Retrieved 6 May 2017. ^ "Definition of disc golf". Retrieved 20 December 2017. ^ "Is The Hand-Wringing Over 'Frolf' Worth The Worry?". Ultiworld Disc Golf. Retrieved 20 December 2017. ^ a b "On Your Own; Connecting a Fairway". The New York Times. 2 July 1990. ISSN 0362-4331. Retrieved 10 May 2017. ^ a b "2016 PDGA Membership Growth" (PDF). 15 March 2017. ^ "History of Disc Golf – Deaf Disc Golf Association". www.ddga.org. Retrieved 2 June 2017. ^ Pg. 72" A Chain of Events – The Origin and Evolution of Disc Golf"
^ "Disc Golf". Disc Golf History. Retrieved 28 June 2013. ^ "Canadian Open Frisbee Championships". Frisbee Pioneer Ken Westerfield. Retrieved 24 December 2014. ^ "History of Frisbee and Flying Disc freestyle". Development of Frisbee in Canada. Retrieved 16 October 2017. ^ Altmyer, Don (2011). "Kevin Donnelly: Disc Golf". Disc Golfer (Fall 2011). ^ Gregoire, Matt (23 September 2008). "Brief History of Disc Golf and the PDGA". Professional Disc Golf Association. Retrieved 11 May 2017. ^ "History of Frisbee and Flying Disc freestyle". Development of Frisbee and disc sports. Retrieved 6 April 2018. ^ "Greater Rochester Disc Golf Club". Retrieved 25 December 2017. ^ "History of Ultimate Frisbee and Disc Sports". Retrieved 25 December 2017. ^ Anonymous (23 September 2008). "Brief History of Disc Golf and the PDGA". Professional Disc Golf Association. Retrieved 18 April 2018. ^ "About Ed Headrick - Father of Disc Golf - DGA | Disc Golf Association". DGA | Disc Golf Association. Retrieved 11 May 2017. ^ Gregoire, Matt (30 January 2015). "Disc Golf Hall Of Fame". Professional Disc Golf Association. Retrieved 11 May 2017. ^ "Innova - The Choice Of Champions - #1 in Disc Golf - Innova Disc Golf". innovadiscs.com. Retrieved 11 May 2017. ^ "Ed Headrick, Designer of the Modern Frisbee, Dies at 78". New York Times. Retrieved 14 June 2002. ^ "The History of Disc Golf". Discgolf.com. Retrieved 27 December 2011. ^ "Archive: 1978 Disc Golf Association Disc Golf Promotional Development Guide. PDF 11 pages" (PDF). Discgolf.com. Retrieved 29 September 2013. ^ a b c d "PDGA Disc Golf Course Design Recommendations" (PDF). PDGA.com. ^ "PDGA Disc Golf Course Design Standards - DGA | Disc Golf Association". DGA | Disc Golf Association. Retrieved 11 May 2017. ^ "Disc Golf Course Review: View and review over 6000 Disc Golf Courses!". www.dgcoursereview.com. Retrieved 9 May 2017. ^ Slocum, Bill (11 June 2000). "A Good Golf Game? It's All in the Wrist". The New York Times. ISSN 0362-4331. Retrieved 10 May 2017. ^ pdga (9 October 2008). "A Guide to Disc Golf from the PDGA". Professional Disc Golf Association. Retrieved 9 May 2017. ^ steveganz (20 January 2016). "The Disc Golfer's Code". Professional Disc Golf Association. Retrieved 9 May 2017. ^ Eastham, Susan L. "DISC GOLF: Teaching A Lifetime Activity." Strategies (08924562) 28.6 (2015): 3–8. SPORTDiscus with Full Text. Web. 1 Aug. 2016. ^ "The Definitive Guide to Disc Golf". www.triumphbooks.com. Retrieved 21 April 2016. ^ "Throwing sidearm". Disc golf review. Retrieved 6 January 2015. ^ "Texas Disc Golf Team Championships". Circular Productions. Retrieved 27 December 2011. ^ "2007-2014 International Demographics" (PDF). ^ Golf, Parked: The Sociology of Disc (1 May 2017). "Disc golf is trending in U.S. newspapers: Supporting evidence for disc golf's "fast-growing sport" claim". Parked. Retrieved 11 May 2017. ^ "Disc Golf Courses in the World - Disc Golf Course Review". www.dgcoursereview.com. Retrieved 11 May 2017. ^ "thediscgolfguy". YouTube. Retrieved 11 May 2017. ^ "Central Coast Disc Golf". YouTube. Retrieved 11 May 2017. ^ "Disc Diva Socks". Discgolfdiva.startlogic.com. Retrieved 29 September 2013. ^ "Disc Golf Hall of Fame". Professional Disc Golf Association. Retrieved 15 April 2016. Wikimedia Commons has media related to Disc golf.